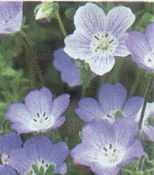 Baby Blue Eyes - Nemophilia insignis - Annual; Native California wildflower easily grown from seed. Delicate sky blue, cup shaped blooms appear throughout the spring. Requires light sandy soil with moderate amount of water. Full sun to partial shade; plant height: 12in. Five Spot - Nemophilia maculata - Annual; A native California wildflower with 1in. white blooms with purple spots at the tip of each petal. Best sown where it is to grow, as it does not like to be transplanted. Full sun to partial shade; plant height: 12in. Speckles - Nemophilia atomaria - Annual; Snowy white blooms with scattered spots of black. Long blooming, it lasts all summer. Great bedding or container plant. Full sun or partial shade; plant height 4-6in.